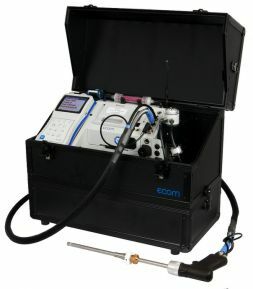 All ECOM Portable Emission Analyzers carry a 12-month warranty on parts, accessories, and 18-month on sensors. The warranty will begin on the date the instrument is dispatched from ECOM America Ltd., Gainesville, Georgia USA. This warranty does not cover abuse or misuse. Please read our Limited Warranty. ECOM America offers Extended Warranties on all new analyzers purchased. Please speak with your ECOM representative today for more details. If a unit comes back in within 30 Days after being repaired at the ECOM America service facility in Gainesville, GA, there will be no charge for labor or calibration. This does NOT include damage as a result of misuse of the analyzer or replacement of non-warranty parts. Standard rates apply if the analyzer is being sent in for standard service and calibration. If a unit comes back in within 60 Days after being repaired at the ECOM America service facility in Gainesville, GA, there will be no charge for labor. A calibration fee will be charged if the operation hours of the analyzer has exceeded 40 hours. This does NOT include damage as a result of misuse of the analyzer or replacement of non-warranty parts. Additionally, a 1-hour labor fee will be charged for the installation of non-warranty parts. Standard rates apply if the analyzer is being sent in for standard service and calibration. ECOM America also offers Service Contracts for all analyzers after purchase.